Let us create a walking tour for your whole family! 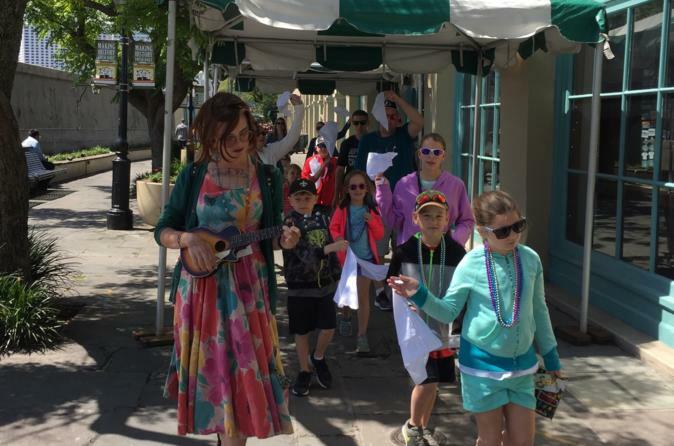 Put on your complimentary Mardi Gras beads and treat your kids to a fun, friendly walking tour through New Orleans oldest and most famous neighborhood! This 2-hour tour meets in Jackson Square and explores such interesting New Orleans topics as Mardi Gras, voodoo, jazz, Creole cuisine, pirates, history, and more! The whole family will learn, have fun, try a few local snacks, do some simple hands-on activities, and end in the French Market in time for some midday shopping and eating! This is the private version of our regular Kids and Family Tour. On a private tour, we can customize the route and activities to suit the ages of your children, your walking pace, and your interests and expectations! The night before your tour, your local guide will text you with his or her contact information so you will know who to look for. Your guide will ask about dietary restrictions and/or allergies and the ages of the children participating. This is your private tour, which allows us to choose crafts and stories that are age appropriate and tailored to you family's interests. On the morning of the tour, your guide will meet you in Jackson Square and everyone will toss a penny in the fountain for good luck and put on some Mardi Gras beads. Your family will enjoy a local snack (the snack varies depending on allergies and seasonal availability) while your guide presents you with a quick, easy history of New Orleans (with pictures!). From Jackson Square, you will follow your friendly tour guide through the bustling, colorful streets of the French Quarter, as you learn about pirates, Mardi Gras, voodoo, jazz music, second-line parades, Creole cuisine, and history. You will also learn about how kids and families lived in New Orleans in years past. Your children will be captivated by the colorful sights and sounds of this vibrant neighborhood and you will also learn a few things and be able to ask your guide to make recommendations of other things to see and do in New Orleans. Along the way, your children will be able to stop and do 2-3 hands-on activities that New Orleans children love. Like the snacks, the activities will vary depending on the ages and abilities of the children on the tour. Toward the end of your tour, each with your own second-line handkerchief, your family will have a traditional second-line parade to a favorite jazz tune. The tour ends in the French Market, where everyone will have one last chance to ask questions before you can eat and shop where New Orleanians have eaten and shopped for generations! After the tour, you will have your guide's contact information for further recommendations and questions. Even parents and grandparents love this tour!